There is no substitute for exploring the Grand Canyon on foot. The majority of tourists stay firmly on the rim on short walks or on scenic drives. With the thousands of other tourists, it is difficult to get a sense for any solitude and take it in. Hiking below the rim allows you to quickly get off the beaten track and get a sense for this staggering scenery. 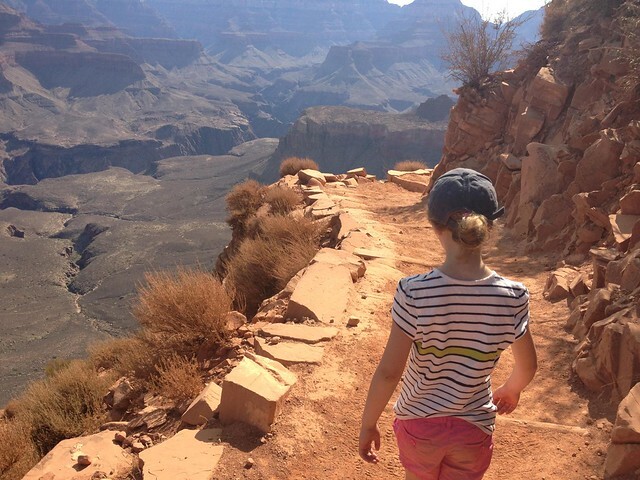 There is no reason why children can’t enjoy hiking in the Grand Canyon and with good planning, then it can be an adventure to remember for the whole family. For children aged 8+, we suggest the Havasu Falls trek, which is located outside of the Grand Canyon National Park, in Grand Canyon West in the Havasupai Indian Reservation. This trek takes you to some amazing waterfalls with lots of natural pools, so there are opportunities for fun and swimming as well as walking. These trips include camping and are mule supported so you don’t need to carry your own kit. If you don’t like the idea of over-nighting, then you might like to consider the option of day hikes. Your guide will assess the ability of everyone in your family and will then suggest a hike based on your ability. Popular options include South Kaibab to Cedar Ridge, the Hermit Trail to Dripping Spring and Grandview trail to Horseshoe Mesa. If you want a multi-day trek without the hassle of having to carry your own kit, then a mule-supported trek is the best option for you. Our favourite of these hikes is the 3 Day Bright Angel loop which takes you to the bottom of the Grand Canyon, spending the night camping at Phantom Ranch, on the banks of the Colorado River. Alternatively, the Havasu Falls trip (3 days) is also mule assisted. Backpacking in the back country allows you to get well and truly off the beaten track, but does mean that you will need to carry all of your gear with you. These trips require a permit, so will need to some advance planning. The ultimate in backpacking in the Grand Canyon is the rim to rim trip. Lasting 4 days, this is one of the most iconic trips in the Granmd Canyon and involves trekking from the North to the South Rim, crossing the Colorado River at the bottom. This is one of the most popular backpacking trip in the area.